In my 300 hour teacher training, I enjoyed hearing the opinions of established and reputable yoga teachers of what we should and should not be as teachers …I heard “get out of their way” so they can have their own experience. I agree. I heard warnings about ego creeping up in your teaching. I agree again! Also, our role is not to be yoga therapists. And we are definitely not medical professionals that can diagnose and treat injury! These are things we should not do…and should not be. Just out of curiosity I asked some of my regulars, who are also my friends, what they felt like the teacher’s role should be and the answers where varied…not surprising, but what they said was interesting. Eye opening. All valid. And their answers helped me formulate my answer to what is a yoga teacher’s role. A first time yogi said “to teach and guide students in the practice of yoga, motivating them to grow in their mind, body and spirt by demonstrating poses, creating an intentional plan for each session and setting an environment conducive to mindful, relaxing and focused class.” I agree. I think we should be a guide…a motivator…a holder of space…a planner… The planner was a new idea for me, but I get it. When I go to a class I don’t want to have to think about what to do sometimes…it’s nice to have a creative, intentional plan thought out that I am guided through. I have to think and plan to much with two kids, a husband, three jobs….it’s nice to go and flow and not have to think about anything but that intentional breath. One regular said, “To guide a student to a place of humility and peace through awareness of one’s body and physical practice.” I love being a guide on a humble journey where the destination is peace and awareness! One gentleman said, “In a nutshell the role of a yoga teacher is to instruct, strengthen, recharge, and help a person tap into their inner being to become a better person.” Love this…but the new idea for me was BATTERY! YES! This makes so much sense to me! I go to yoga myself to recharge!!! And I love that his end goal is to become a better person! Another student said, “To help students become stronger physically and mentally. Build confidence and encourage all levels of yogis to strive to do their best.” What I learned from this statement is “cheerleader”. And I am. It is my hope that they gain confidence and knowledge about the asana to be able to safely do them at home and develop a home practice…and it’s my hope they’ll take yoga….what it is for them…off the mat! One long time student said, “ Guide, fitness and spiritual professional, and mentor.” And “leader of booty-asana”. This is true! I am leader of booty-asana and that is important to that person! Because I give him permission to be silly in that moment! And laugh! I hold space for this suit-wearing community leader to come to yoga and feel like a kid again and enjoy playing on the mat and getting into his body. I also heard, “As a yoga instructor, you teach students the basics of yoga with the goal of them eventually being able to master these and more difficult moves. This is done using different poses and mindful breathing techniques to develop strength and promote relaxation.” Love this one…because I know this student is gaining confidence in his studio practice and beginning a home practice!!! Another regular said, “The role of a yoga teacher is to show their students that there is another way. With absolutely everything there is another way. That can mean challenges getting into a pose that can be adjusted with modifications or props. But that can also mean challenges in life, and giving a student that safe place and support to allow them to reflect and really take stock of where they are, where they want to be, where they can be. The role of a yoga teacher is, in a sense, to be a guide to everything the student already has within them if they just take the time to look.” I LOVE THIS SO HARD! Should we change what we are called? Yoga facilitator doesn’t have as nice of a ring to it. I am a facilitator of yoga…still no. I am a teacher. A holder of space. A cheerleader/motivator. A guide. A planner. Leader of booty-asana. 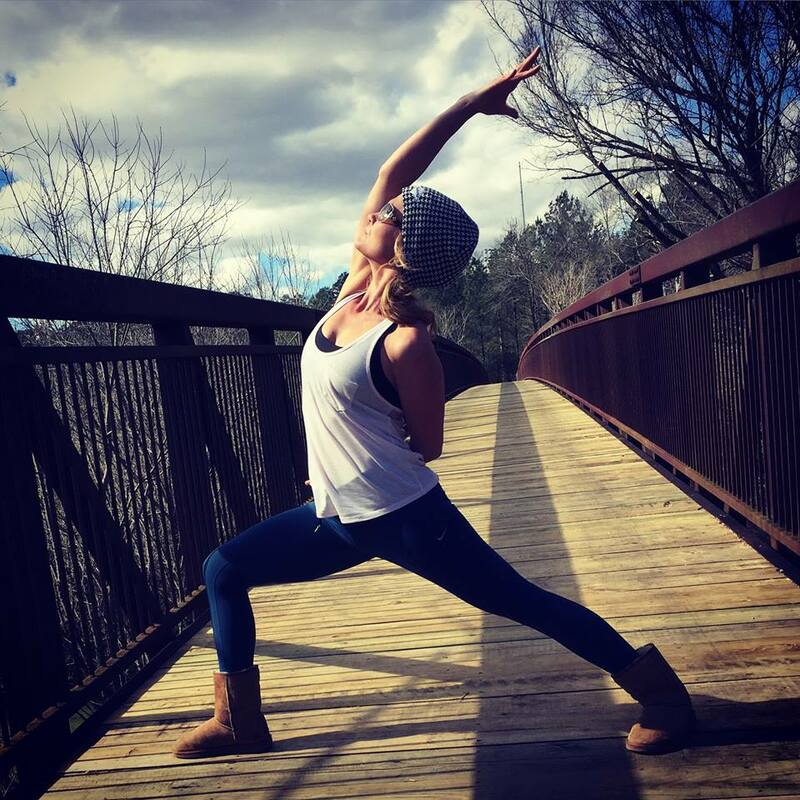 Brooke Smith is a television news anchor early weekday mornings on WVTM13, a mom to 2 busy girls by day, and running yogi by night. Brooke’s goal is to run a marathon or ultra marathon in every state! She started getting overuse injuries from the long miles of training and was encouraged to try yoga. She found the style of yoga that was right for her and became a more patient mom. Yoga helped lengthen those tight running muscles. She believes that yoga has a place as a cross training tool for cyclist, tennis players, and other athletes. Brooke also discovered the spiritual, mental, and emotional benefits of a regular yoga practice. She received her 200 hour yoga teacher certification from Sacred Glow Yoga with Melissa Scott. She looks forward to continuing her yoga journey as she pursues her 500 YTT with Melissa. Brooke is also a RRCA certified running coach.